Think of radiant heating like the lighting in your home. Radiant heating quietly and gently fills the space you occupy, surrounding you with warmth. Unlike heated forced air (which rises), radiant heating, through heat transfer, delivers heat directly to the people and objects in a room. In turn, the objects absorb the warmth and radiate warmth back out into the space. You stay comfortable because the warm floors and other surfaces do not rob heat from your body. Also, the temperatures from the floor to above your head are relatively the same. 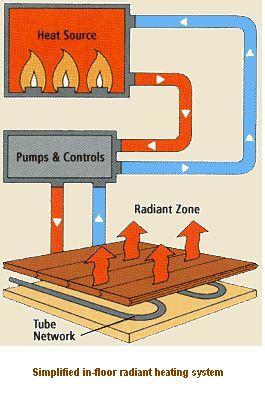 Radiant heating systems are designed to condition the space you occupy, from the floor to 7' or 8' above the floor. The conventional forced air system does not, and cannot, provide this all-around luxury. A conventional forced air system delivers air from it's registers at a scorching 120* to 140* F., which quickly rises to the top of the room. As the air cools it falls to your feet. Consequently, your head is often in the warm zone, and your feet remain cold. This problem of a forced air system can be improved with placement of a return grille at the high point of a room, and additional returns located low to pull the warm air down and across the room. Most people that have spent much time in a radiant heated home have a hard time feeling comfortable in a home heated conventionally. The floor in a radiant home is the warmest part of the room and the ceiling is the coldest area. The home's thermostat is set lower, and yet the occupants feel warmer. 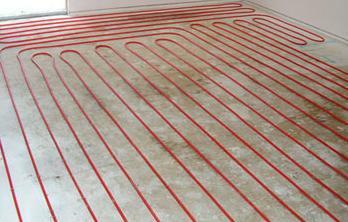 Radiant heating can be supplied in a home hydronically or electrically, in floors, in walls or ceilings. But, by far, the most economical, efficient, and comfortable system is the hydronic floor heating system. For this reason, this page is devoted to hydronically heated floors. 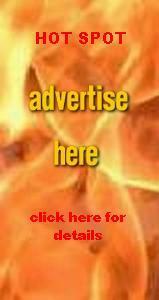 At the bottom of this page, please find links to other radiant options. A hydronic floor heating system is best installed during new construction. PEX tubing is stapled down to the plywood floor and then 1 1/2" of gypcrete (a lightweight concrete) is poured around and over the tubing. Floor finishes and coverings can then be installed over the gypcrete. For this reason, this type of floor should be planned for early in the construction. Tile and wood floors can easily add an additional 1" or more of depth to the floor, making the floor 2 1/2" to 3" deep. Doors must be planned accordingly. Height of stairs, amongst other items, must be designed taking into account the additional floor depth. This type of floor heating system can be retrofitted into an existing structure under the right conditions. A homeowner considering this option should go into the project with his eyes wide open. The structure's floor must be capable of carrying the additional weight. This could involve beefing up or adding joists or beams below. A structural engineer should be consulted. Ceiling height is high enough that the loss of 3" is not an issue, especially code-wise. Structural changes are expected. Doors will need to be replaced or shortened. Cabinets will need to be removed and reinstalled, anticipating that the space between upper and lower cabinets has changed. Plumbing, air conditioning ducts, and thru-floor electrical components will need to be adapted for the added depth. A staple up installation can be a viable option, especially for a retrofit installation. The tubing can be installed from below, inside the floor joists, against the underside of the plywood. Then reflectors and insulation are installed beneath directing the heat up through the floor. This type of installation can be expensive though. This installation has many obstacles, such as electrical wiring and forced air ductwork already located inside the joists. These obstacles certainly add dollars to the installation cost. A gypcrete poured floor is not the only option for above floor installations, although it is the most commonly used. An additional benefit of the poured floor is it's solidity and quietness. Other systems have been developed where the tubing can be installed in grooved panels or in snap together grids. Conventional hydronic radiant floor systems are the most popular and cost effective of the radiant systems. 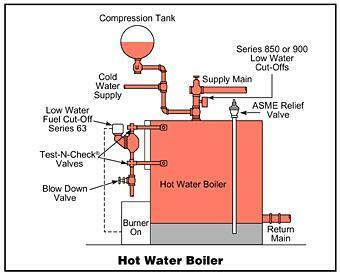 These systems utilize a boiler (gas-fired preferred) to heat the systems water or water/glycol mixture. Then a series of pumps moves the now hot water through the under-floor tubing, where the heat is transfered to the living space. As the heat is transfered, the water cools and is returned back to the boiler to start the process over again, until the thermostat is satisfied. Due to tubing loop length limitations, many tubing circuits must be installed from the manifold location. Room-by-room zoning can often be accommodated by addition of a thermostat, low voltage wiring, and a zone valve dedicated to that zone. On initial installation, your contractor may have your home set up for fewer and larger zones. Make sure that the tubing is installed separately for each room that could eventually be it's own zone. Future zone thermostat wires can be pulled between the manifold location and a future thermostat location in that possible future zone. The wire can be left inside the wall, just make a drawing or notations of it's location and keep with your homeowners manuals. Then the day comes to zone the room on it's own, half the work is already done, and no wall damage to pull wiring. Ceramic tile floors are, by far, the most common and effective floor covering for a radiant home. A ceramic tile floor conducts the heat well and provides thermal storage. Other floor coverings such as hardwood floors, vinyl, linoleum, and carpeting may be used over a radiant floor, but caution must be taken with some floor coverings. Carpeting and carpet padding act as an insulator. Your radiant installation company should know early on of any areas in your home that you intend to install carpet or lay down large throw rugs. Remember: The thinner; the better. Caution should be taken with wood floors, as well. Wood floor planking should be a laminate, instead of real wood. Real wood can shrink and crack due to the drying effects of the radiant heat. An expensive wood floor could be ruined over time. Installation of a radiant heated floor system can be 1 1/2 times the cost of a conventional forced air system. But once it is installed, the radiant system can be 30% more efficient. Doesn't take that long before you are smiling on your way to the bank! Most of these types of systems are installed with an outdoor reset control, which monitors the rise and fall of the outdoor temperature. Then the system increases or lowers the amount of hot water flowing through the system in response. 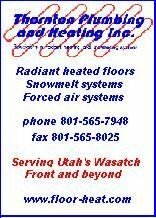 The Radiant Panel Association (RPA) is a great source of information concerning all aspects of radiant heating. Go to Radiant Panel Association's website to read queries, ask questions, or join discussions about all radiant heating subjects in the RPA's forums. Slow response time. Thermostat set-back, during times of low occupancy, is not an option, unless you have a secondary heating system installed, such as a furnace. The furnace would heat the home until the radiant had caught up and taken over the heating chores. More expensive to service. Pumps can fail. Boilers are expensive to replace.